How do we talk to our sick child and our other children about the diagnosis? Professionals agree that honesty is the best policy. There are age-appropriate ways to discuss a diagnosis with your child. Your social worker can assist you with this if you are uncertain where to start. Younger children need basic information that will explain what is happening to their bodies and how the doctors are going to help them. Older children may want to be part of the doctor-family discussions. The doctors will always take the time to explain in simple, clear terms so the child can understand. Children will adapt better to the treatments and hospitalization if they understand why they are receiving treatment and how the treatment will be given. All the medical, nursing, and psychosocial staff at the hospital are available to support families through this process. How do we discuss treatment with our child and their siblings? It is best to explain the treatment your child will receive in age-appropriate ways. 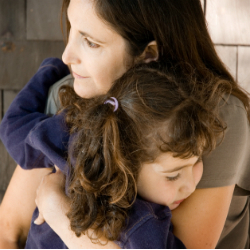 As a parent, you are your child’s greatest ally during treatment. Not being honest about treatments may lead your child to believe there are other things they’re not being told. Discussions about treatment and possible side effects do not have to be long and detailed, but you should bring them up early in the process. Children will then feel they can ask any questions they might have. What services are available to help patients and families adjust? All members of your child’s treatment team are available to work with you, your child and their siblings to help your family adjust to the diagnosis, hospitalization and treatments. Our goal is to make your child feel secure and cared for while receiving treatment and follow-up care, and for your other children to understand they are important too. Are there services available to prepare our child for treatments, procedures, and surgeries? Child Life specialists  are available to help your child with preparation for treatments, surgeries, and adjustment to life in the hospital. Child Life specialists use a variety of play therapy techniques to meet this goal. All health professionals on your child’s treatment team are available to help in this process as well. How can we expect our children to react to a diagnosis? And what can we do to help? There is no right or wrong way for a child or their siblings to react to a diagnosis. A child may be tearful and upset, or seem nonchalant about it. What’s important is to be open and honest with your children, which is their best tool and their greatest security. Our family and friends are giving my child gifts and lots of attention. I am worried about how our other children might feel about this. It’s common and normal for children to be jealous about the attention that is given to a sick child. As parents, you can help by setting limits for friends and family about giving gifts. Also, you can discuss the reason for this increased attention with your other children. Making special time to spend with them, emphasizing how important they are, and giving them a role to do are often the best ways to help with this. How can I help my child maintain positive self-esteem and a good body image while undergoing treatments? It is important to let children know that certain changes to their physical appearance are temporary. Some medications may make children gain or lose significant amounts of weight or can lead to hair loss in some cases. Acknowledge the physical changes and validate your child’s feelings about them, but do not dwell on them or make it the focus of discussions with family members and friends. Talk to your child about what makes them special and find ways to incorporate your child’s strengths into the treatment process. My child is asking many difficult questions that I do not feel equipped to answer. What can I do? Speak to the social worker or any member of your child’s treatment team about your concerns. They will be able to provide you with resources and offer information and guidance to deal with these questions.